Bitcoin and The Blockchain: Will The Real Bitcoin Please Stand Up. Please Stand Up. Will The Real Bitcoin Please Stand Up. Please Stand Up. Over 2600 years ago, far away in the mist of time, in ancient Turkey, the Lydians and the Medes had been at war for 5 years. According to the Greek philosopher Herodotus, in the year 585 BCE, in the midst of battle, there was a solar eclipse and day was turned into night. The Lydians and the Medes took it as an omen that the gods wanted them to stop fighting and so peace ensued. Tomorrow 21 August 2017 there will be solar eclipse over large swathe of the USA. On this day the Big Blockers and Small Blockers who have been at war for nearly 5 years decided to lay down their keyboards and peace came upon us and the community was once again united.....LOL NOT. Over the last 3 days the whole of crypto and mainstream media was ablaze with the news of the nearly five fold increase in BCH price to over 1000 USD, sweeping aside all predictions of its' early demise. Of course to those of us who are of the opinion that the BCH fork was a fork back to the original bitcoin, we are not at all surprised. It was rather expected and with the anticipation of more to come, until the Cashening. Looking back, we learn that 55% of the trading volume over the last 24 hours amounting to 1.7 Billion USD, yes billion with a "B" was transacted on 3 South Korean exchanges. To put this in context, the total worldwide 24 hour trading volume for BTC was only 2.6 billion. More important was that the 1.7 billion was in fiat. Not BTC. 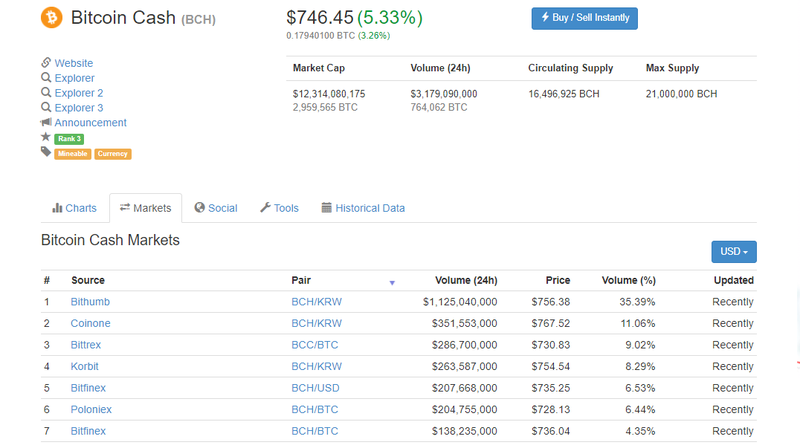 It is clear now that BCH explosive price rise was a result of heavy buying from South Korea with "new money". So why only South Korea and for BCH? There was no buying pressure from China or Japan. China played a huge part in BTC trade volume until the Chinese government clamp down on the exchanges. The slack was later picked up by Japan when the Japanese Government legalise Bitcoin on 1 April this year. Then on 24 July South Korea made bitcoin payments legal. South Korea the world's 12 largest GDP and a East Asian Tiger economy made its' mark in the crypto world with a huge play in BCH. South Korea the home of Samsung with 17% share of the world mobile phone market is now officially in the crypto business, and they selected BCH as their vehicle. This is significant and mark the difference in philosophy and approach by these 3 East Asian economic competitors. China chose to develop their own national digital currency. Japan decided to go with BTC and South Korea have chosen BCH. Who will be right? Coming back to the 1.7 billion USD 24 hour trade in BCH. This amount of money cannot come from just ordinary citizens. Large institutions and perhaps even banks are involved. This play is not over. Not by a long shot. Expect to see higher and quicker price rises in BCH, especially when the rest of the world catches on to what is really happening. Will the real Bitcoin please stand up. Yesterday for the first time it became more profitable to mine BCH than BTC. Today at block 479808 BCH had its' first standard difficulty adjustment and is now only 7% the mining difficulty of BTC. These are watershed moments and marks the point at which miners will choose to mine the more profitable BCH chain, and initiating the dreaded Chain Death Spiral for BTC. So when will BCH replace BTC as the real Bitcoin? In a Twitter post, Gavin Andresen said that he will refer to BCH as Bitcoin if it has the longest chain and his view is echoed throughout the community. Over the last 24 hours 139 BTC blocks and 263 BCH blocks were found respectively. This is a difference of 124 blocks. As of now the BCH chain is 1452 blocks behind BTC. This means that in as little as 11 days and most probably earlier the BCH chain will overtake the BTC chain to become the longer chain. Will we then call BCH Bitcoin? Another twist. Ryan Charles in his latest Youtube post suggested that BCH should just be called CASH. Wow. What a great idea. A totally left field proposition and yet on reflection its' simplicity is indeed powerful. BCH is exactly that - CASH - Spending Money. So now we come back to the question of between China, Japan and South Korea, which country chose correctly. My money is on South Korea. What's yours?